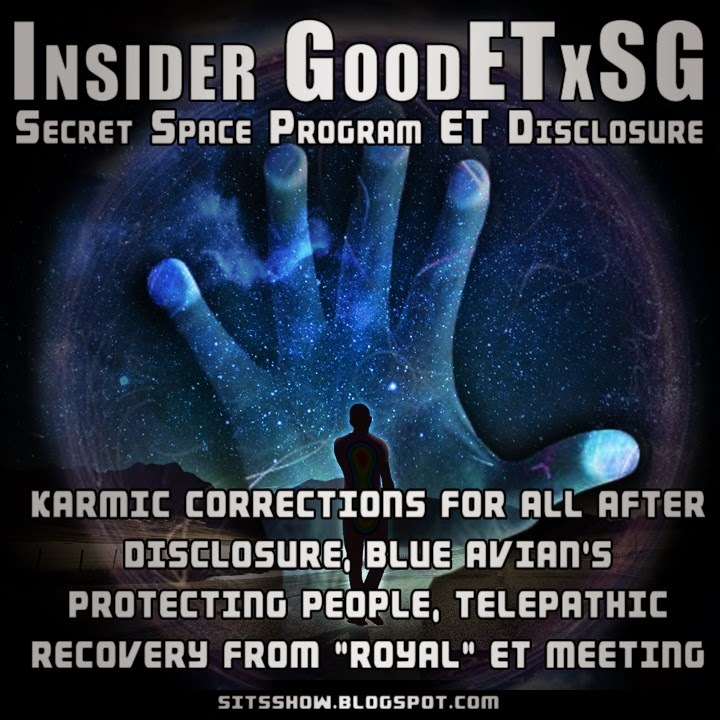 Here are some recent updates by GoodETxSG directly from the One Truth Forum. Corey's recovery from meeting a highly telepathic "Royal" from one of the ET races in the alliance. Projection from Blue Avians which is limited by Karmic actions of the people they protect (i.e. if someone acts to create their own karma, they can not protect them from those actions. Guardians and the Watchers group working with the Alliance. Question from a reader about ET contact coming in the form of recurring dreams. Golden Brown beings are a third density race, and 'nasty' according to Corey. When Disclosure happens, those who were just following orders are going to be responsible for their actions. I found Corey's comments about order followers particularly interesting, and it refers to the karmic corrections described in the update here. This idea of moral culpability and order following is not popular, as it draws awareness to our own actions, but it is a major point which can not be overlooked in my opinion. I can hardly claim these conclusions as absolute truth, but I have taken the time to determine their accuracy with research and critical thought. I hope we can begin to discuss these more as a collective in the future. From a Natural Law perspective, the order follower is always more morally culpable than the order giver. The Cabal know this very well, and despite many people wanting to believe we are 100% victims, it is the people themselves that are carrying out the cabal's plans. This goes across the board, whether you are a high ranking cabal member or completely asleep, aquicessence is the mechanism which keeps the cabal in power. In this sense the people have a great deal of karma corrections to go through. In my view, it is easier to think of the Cabal at its core, as a belief system or thought form, which is brought forth into reality, by those human beings who have accepted it, and choose to carry it out. For example, if someone tells you that cutting yourself will lead to good health, and you blindly believe it, you are now under the control of this belief, and actually cut yourself thinking it will be good for you. In this sense the idea is like a virus or A.I. program, unless it is dispelled by critical thinking and discernment. 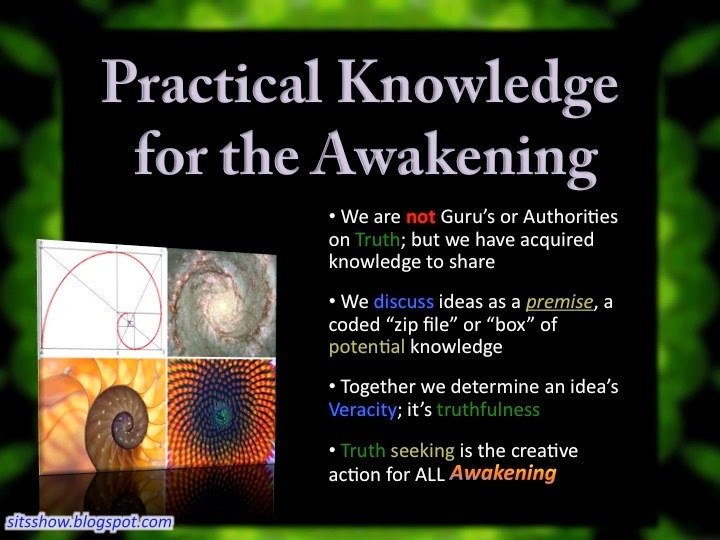 The Cabal program works by pacification, discernment is an active process using the conscious mind (masculine) and unconscious mind (feminine), as such if we never practice discernment, consciously questioning a belief, another's masculine aspect (their will) can dominate our unconscious. This is the basis of all mind control. And is symbolically represented in fictional works and architecture as the 'goddess or feminine in distress.' See the post Divine Feminine in Distress - She is waiting for your Divine Masculine! for more on this. Karma can be thought of as the universal mechanism for nurturing the development of discernment. Since it requires both the masculine and feminine aspects to discern, it literally creates knowledge which empowers the individual to act in harmony with the creator. 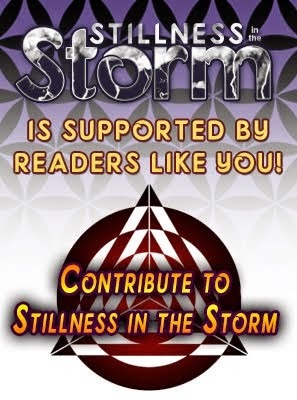 Within the context of the Cabal, it empowers the individual to become an active player for healing karma and offering forgiveness, an STO modality. The inertia described here is mental inertia, blind belief. Order followers blindly believe their masters, and as such the mental inertia flows from the order giver to the order follower, who then manifests the order into reality. Blind belief is also a form of mind control, again because the conscious mind is not used to discern, and the belief settles into the unconscious; changing our perspectives and desires. If the belief is not questioned, and a rational judgement developed within the person receiving it, they act under the direction of another mind. Hence all order followers are under mind control, as they have not used their powers of consciousness to discern. The order follower has the power to question the idea, and make a moral choice to STOP the inertia, therefore correcting the karmic imbalance of the order giver for themselves. In this case, the order giver now has the moral culpability, as the flow of inertia stopped with them. And the karma of the order follower is corrected by them taking an action - NOT following the order. This is the forgiveness Ra speaks of, and defines it as an active process. Conversely, if the order is followed, the person who actually brought the order into manifested reality has MORE moral culpability. Both create karma, but the order follower has more karmic corrections to go through then the order giver. Because the universe is attempting to nurture the creation of knowledge within, the order follower does not learn from blindly following, and as such takes on a karmic debt. The notion that people who have been duped into following orders or remaining inactive in the face of immorality have more karmic corrections to deal with is a sobering one. Many in the awakening movement want to maintain the belief that we are totally blameless for the present state of affairs on earth. However, the truth is, we all collectively contribute to the co-created reality, and as such we all have some amount of karmic corrections to go through, as the point of karma is to teach, not to dole out suffering as some form of universal justice. Karma is not an eye for eye mechanism, it is here to teach us, and so long as we avoid learning, it will continue to overshadow our lives. These concepts are well grounded in everyday terms. The Cabal maintains power within a trust law relationship, and we described this deeply in the post How the Cabal Maintains Their Power And What You Need To Do To Stop It - Un-Consent. Contracts and Trust relationships are not the creations of man, they exist in nature and are part of the fabric of reality itself. The narrative can be summed up as follows: The Creator is within each being in the universe, from small to large, and when free will acts, it is literally an aspect of the creator in operation. The powers that should not be know this deeply, and this can be seen by reviewing the Papal bulls of the Vatican. When the creator 'sent us forth into the creation to move, breathe and have our being' we agreed to do the 'working of god' and honor 'his will.' We were entrusted with a mind, body and soul to do this, creating our 'temple within' and help create a harmonious paradise on earth. The powers that be know this, and have described it within their own writings. The covenants of God, within most abrahamic religions, are an example of this. Papal Bulls assert the Vatican and it's trustees as the trusted consorts to god, stating until God or the people do otherwise, their rule is divinely ordained; until we dispel their presumption of god given authority. They say: until we 'come of age' and realize our purpose, those who have 'come of age' are entrusted to share their knowledge and educate us so we can do the great work. If we refuse to do the work, and fall into sin (ignorance of our original trust with god to do his will) a trusted consort to god must come in and manage us till we see the light; the Vatican and it's agents in this case. Because each person is a powerful embodiment of the creator, if we use our powers unwisely, we can create much chaos in the world. Until we come of age, and begin using our will to create harmony we must be managed like animals and spiritually dead things. While this is a sobering perspective to contemplate, it is in harmony with Natural Law, but the Vatican fails to do what god commands them to do (educate and uplift humanity) and this is a crucial point we will address later. Where things go horribly wrong is that our 'consorts to god' our would-be masters, are in Breach of Trust with god. They are morally obligated to share the truth and uplift us so we can become competent. More on this later. Because we are one with the creator, our choice to stay ignorant and inactive is literally consent to the Cabal, and in a way, following their orders to "stay subservient and incompetent." In this sense, anytime we act in a way which harmonizes with the cabals tyrannical plans, we become an agent of the Cabal, and have incurred a karmic debt, which must now be corrected. A good example of this is vaccination, a hot button issue. I encourage personal research as always, but to summarize my own knowledge: vaccines are designed to destroy health, and have no valid application. Any immunizing effects of being vaccinated are lost after several years, and it is not the best way of providing immunity. As a result, when people blindly believe that vaccines are valid, and allow themselves and their children to be injected, they are acting in concert with the Cabals plans, following their orders by proxy. Thankfully the universe is designed to reveal these missteps to us, by providing us a contrasting experience. Pain and suffering in this sense, is a universal reflectivity mechanism, showing us at a very deep and personal level, that our choices brought about the condition we say we do not want. Each of us has the potential to develop personal knowledge and question any belief fully. This activates our powers of discernment, the stopping action Ra spoke of, and literally offers forgiveness, because now false beliefs can be expanded to reflect accurate truths. Standing in ones truth, and attempting to share it with others - order givers of all types in this case - is a service to others act and offers forgiveness to others within Ra's stated definition. Knowing the truth, and not speaking or acting in it also creates a karmic correction. As Ra mentions above, forgiveness is an action which stops the inertia of an immoral thought, belief or order. Those of us who know the truth, but keep it close abreast out of fear of ostracization, are morally culpable for our inaction. Imagine seeing the mayor of your town poisoning the water supply. The only way for his plans to work, is if everyone remains unaware of the poison in the water. With this knowledge, you now of the power to take action, and reveal this to others around you so they can be empowered to not drink the poison. But if you remain silent, you are willingly acting in harmony with the plans to kill the townspeople, albeit for your own reasons. By taking action and revealing the truth, this potential karma is corrected, and the chance to forgive is offered to others. How can they forgive the mayor if they are unaware anything wrong happened? Finally, the vast majority of governments are de facto insurgent governments. The US has not had a de jure (of the people) government since at least 1871; we could go further back of course. As such, when we vote for presidents, congressmen, city councils, etc. these are not by the people, they are for the people, a foreign insurgent body. This is a very tangible example of how the people themselves not only allow the Cabal to remain in power, but actually work with them as agents by proxy. I think this is what Corey means by Karmic Corrections that will come when disclosure occurs. Can you imagine being a parent who realizes their ignorance of vaccines and poison food doled out suffering on to their children? It will undoubtedly create a major emotional upheaval, and I believe that this is one of the reasons many so called awake people still unquestionably believe vaccines are 'proven science,' it is just too much to face without more knowledge to ground the truth. In my studies of karma and how it works, the key mechanism is to allow for mental evolution. The body acts as a vehicle for experience, the heart provides intuition, but free will acts through the mind, shaping our beliefs, desires and how we act out the information received from the heart and body. The mind is the temple which we create via our choices, described allegorically as Solomons temple; sol and moon, masculine and feminine. As we gain experience, and reflect reality within our minds more clearly, this opens the heart and its ability to receive more higher self intuitions. Our free will and our creative powers are seated in the mind, accessible to us there. Hence the hermetic adage "all is MIND" and why as evolution up the density scale occurs, reality becomes more mental and less material. In this sense, the whole of the incarnated experience is to develop the mind by our own free will, and since we are in a co-creative relationship with the creator, we agreed to the 'rules of the game' in the primal unity moment before embodiment. Karmic corrections are literally the creator working through the creation, to lovingly show us a better way, allowing us to 'build the temple' within by our own conscious choices. Personally, I find this definition of karma to be greatly empowering, as our mistakes literally become gems of wisdom, once we open our minds and shed the victim mindset. This is most likely why highly evolved races like the Blue Avians cannot protect us from our own karma, because it is part of how we evolve. This is also why many people will experience karmic corrections after disclosure, as the knowledge of their culpability will provide them with a context to learn and grow. "Gaia is a honeytrap"... That's a new one to me. Corey, you've gotta be pretty brave to be doing this. Standing toe to talon with a 14ft. Royal, wow. Is there some sort of recovery period after such intense telepathic communication? I imagine you have a strong mind due to your IE training and experience. It must help being an adult with an extra 20 years experience under your belt. (Simon just might be jealous, tee hee). I am just put in these situations. I was not scared at the time but but felt "empowered" this visibly aggravated this being. Afterward I shook for several minutes when the security team was loading onto their craft. Everyone that left that building was happy to do so. If I was a smoker I would have been lighting them end to end. Brave has nothing to do with it. It was comforting that (As everyone will read in the later report) that I was allowed to have 4 security personnel from the SSP Alliance attend with me (Though with the beings present I am not sure they would have been that much of a deterrent, and I sensed that in them as well.). After a prior attempt at a meeting we had to negotiate another venue and allow me to have some security before I would agree to go. I was at a point of refusing to attend. That will be explained. It did take me a few days to recover. I had slight head aches and took constant power naps waking up to shower and eat meals and check online for an hour or two then back to lay down. It "Zapped" me pretty bad... I would not like to repeat that encounter. The "Royal" was not alone either and had other beings (Other Reptilians and Insectoids and Mantids) with him as well as some Humans in suits. I was not fully recovered when I attended the next "Federation" conference days later but it went well. I'm a new member and all your information is very appreciated! I could not find the answer anywhere, but are you protected by the blue Avians? Since lots of whistleblowers are at major risk. I just registered for reading/commenting on what you share because i read some information from you on a different blog and there was this forum mentioned. But I will share infos I have too. Not all but some. I am not allowed to share deep information on the things that are coming. I doubt that they - the Dracs - will be allowed to leave. So they can go on with their control agenda somewhere else? No way. Time is up. No mercy will be granted if they do not change on the soul level. There will be a cleansing of every being not supposed to be on Earth by unstoppable forces they did not even know to exist. Earth is not the only planet. Many are cleaned one by another. And because the whole universe it at risk the "arms of the source of creation" (primal bodyless races), who normally just observe creation, became active and are working together with the Council of Five. Some are incarnated into human bodies and await "activation". Are you aware of the existance of the Council of Five aka The Watchers/Guardians? I use their symbol as avatar. You can read about them in the russian Alien Races Book as well. According to my intel they met on Earth 08/2013 and decided to intervene and started Regulation Nov. 13th 2013. Are you aware of 2017? Their representatives were at the last conference (While a couple are regular attendees). This was the "Federation" conference where there were at most 40 attending races this special occasion there were over 60. I am familiar with that book of alien species as well. There is some accurate information in it. Hey Corey ive been trying to keep up to date with everything but things are crazy here at the moment, i mentioned to you that i felt something massive was going to happen and it turned out you had a meeting that night, must of been almost a week ago, since then ive had dreams that keep repeating over and over literally the same dream like a stuck record every night, I know its the same dream but i cant remember what its about when i wake up i just know that its been repeating. It can be, it can also be your subconscious wrestling with screen memories placed in your mind by beings or "other" operators. You may have intuitively known they were coming that night and when you were "Blank Slated" and had screen memories placed in the absent area of the removed memories your subconscious (Higher Self etc...) knows that something is not right. If you meditate you may try spending some time doing so, focus on that time and if any of the real memories poke through focus on them and more of them may come back. There are a lot of beings that are speeding up their agenda's and work right now with the current status in our "Sol System". Good luck, I hope you can pull some of the threads together so you can get the memories back. I am sure it is frustrating. I found something interesting in reddit today. It seems like someone was visited by the Golden-Brown beings a month ago. His description and yours match for the most part. Was he actually visited by the Sphere Alliance? No, this is a very nasty race that is from our density spectrum. They do not visit Earth very often and this group seems to have chosen to at the wrong time and got stuck. That is not good for some people until they are removed. They harvest something (Fluid that is refined) from humans and animals that helps them sustain themselves. He should have gotten in his car immediatly. I'm not sure if if he started to drive off they would have moved on to another target because he was so isolated. It would have been worth the effort IMHO. He will most likely at some point have some break through memories that are very different than his current ones. The beings from the Sphere Being alliance are all 6th Density or higher. They do not need vessels. They just "Appear" where they want to be. can you talk of Operation Mockingbird and how much will be canceled? The question polarity of people also enables positive to do more and to intervene? In practice, with the effect meditation events accelerate again, at this point 2017 is not a fixed date. The predictive programming and related transaction Mockinbird? If the CIA is 60% below the alliance because it is not changed or canceled Mockinbird? The federation consists of 50 races, the sphere are on the board of the 9? I wish I could say this and those who are Monarch Program (And others, Mockingbird is far more than its "Media Influence"/cover or surface story) would stop being harassed any time soon. I have a very good friend who has aided me recently that is a "Monarch Program Victim" who I have sent his name and info across the desk of "LT Col Rodriguez" (Last name is the one we are using in place of his real name)... I am told it is being looked into. This friend deserves some rear kicking intercession from some groups that the people that are harassing him do not believe/know exist. He is a very good and strong man and I ask about the progress on that topic every time I speak to "Rodriguez". There are quite a lot of psychotic programs and people running them. When full and complete disclosure occurs including the many crimes against humanity there are going to be a lot of psychopaths chanting "I was only fallowing orders". It is going to be difficult to separate those "Operators" who deserve punishment and those who do not. I worry some about that time period myself because of some of the things I was at one time involved in. I had no choice but I knew it was wrong. It is going to be a very difficult and defining time for humanity to witness how we handle the aftermath of all of this information. The "Human Like Federation" normally had at most 40 types beings/"People" represented/present. This last time there were over 60. The Sphere Beings had not mentioned any "Council" to me. I had these other beings reference me as "Representing The Council" and they wanted me to "Petition The Council" on their behalf. I am talking to DW about this and getting some of the "Law of One" perspective, it is somewhat of a mystery to me still but not for much longer I hope. I do not know if this is the "Council" in the Law of One or the "Council" between the 5 higher D beings in the Sphere Alliance (Blue Avians, Orb Beings, Golden Triangle Head Being, and the Two Others that have not revealed themselves yet). I am certain I will find out soon. These other beings seem to be very aware of this "Council" and acknowledge some sort of it having a power over them (If that is the correct way to say it...).